This is a sponsored conversation written by Wrapped Up N U on behalf of SnackPals. The opinions and text are all my own. Life with a toddler can be messy. Thanks to the SnackPals portion control snack dispenser it life just got a little easier. This are absolutely perfect for the lunchbox and back to school treats. As a mom I love that they are kid friendly and dishwasher safe. Toddlers and kids love their snacks --- oftentimes taking more than their tiny tummies can handle. WOW GEAR, the innovators of the spill-free 360° drinking edge WOW CUP, announce the launch of SnackPals, the portion control snack dispenser. 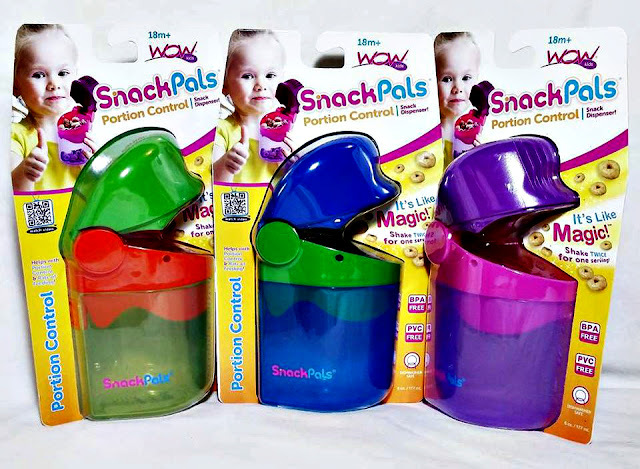 SnackPals offers interlocking hinges to dispense snacks one mouthful at time. When the lid is closed, turn upside down and given a little shake, the flow gate swings freely --- allowing a few snacks to escape. Open the lid and the flow gate stays closed to ensure that snacks only go where they belong. Whether having cereal, goldfish-style crackers, pretzels or other toddler-friendly goodies, SnackPals provides that easy on-the-go food transport to school, daycare, camping, the park, mall, beach, vacation spot or visiting with friends and family. SnackPals is available at www.SnackPals.com as well as major retailers including Toys R Us and Buy Buy Baby. SnackPals come in blue/green, green/orange and purple/pink and retail for $9.99.